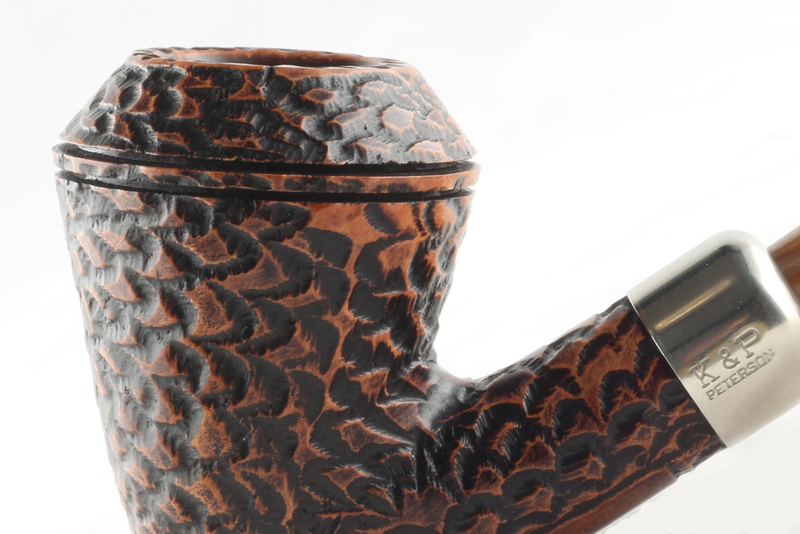 When the Peterson new lines for 2016 were announced last April, I enthused about seeing all the “Killer B” shapes together in one place – the Derry Rustic line. 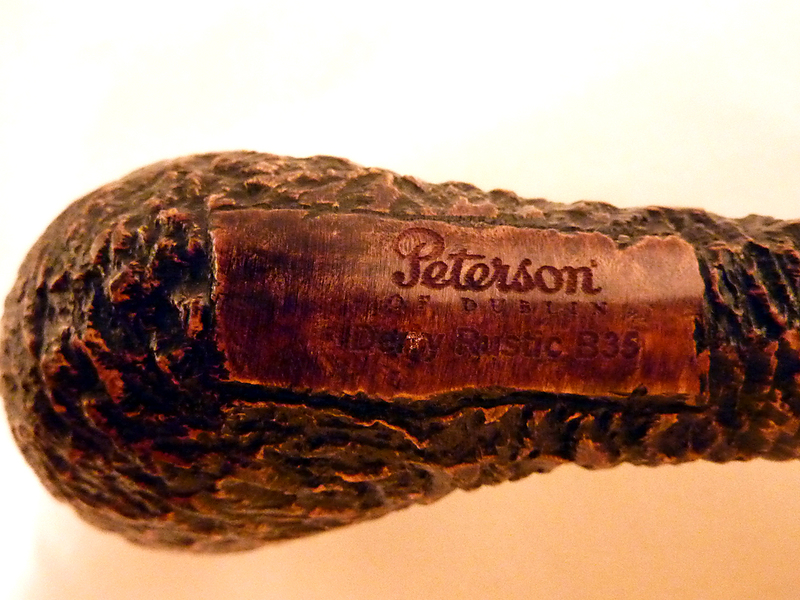 Hard-to-find B shapes, Peterson’s trademark military-mount, rusticated two-tone finish, milk chocolate swirl acrylic mouthpiece – what’s not to like? They began trickling in at U.S. etailers in mid-August, and while several Peterson sites still don’t offer them, I’ve sited 15 of the 25 announced shapes and thought the time might be right to take a closer look. From the start I thought the line might be “hard-wired to . . . self-destruct” – to borrow the title from Metallica’s upcoming album. I say this because for many years Peterson has routinely taken their leftover B shape bowls – what’s left from special collections and Limited Editions –and channeled them into Mario Lubinski projects for Italy (the Kapp-Royal high-grades, Kapreis and Rock of Cashel sterling military mounts) and the St. Patrick’s Day, Christmas, and the old July 4th annual editions throughout the rest of the world. What a fantastic idea. 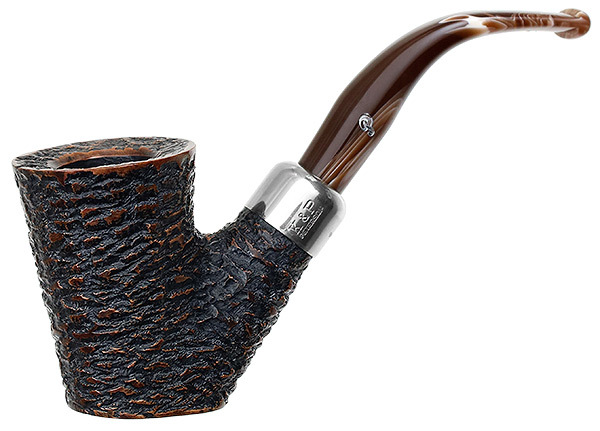 We saw it first in a big way in the Sherlock Holmes collections when Peterson issued an entire line – the Kinsale – to accommodate bowls that weren’t up to the SH quality specifications. More recently we saw it in the release of the 2010 Mark Twain Collection’s Large Tankard in a smooth finish, vulcanite F/T for the 2015 St. Patrick’s Day line. I spoke with factory manager Tony Whelan a few weeks ago, and he confirmed my hunch: the Derry Rustic was introduced specifically to accommodate the use of discontinued bowls, especially the remaining Limited Edition / POYs. From a collector’s standpoint, it’s pretty sweet to be able to pick up some of these almost-gone shapes at less than half their original cost. 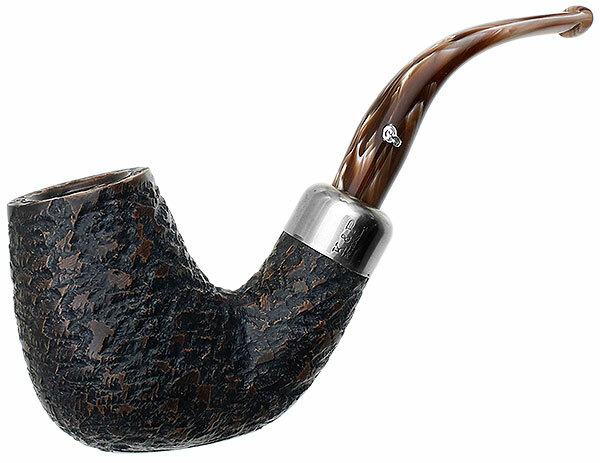 Sure, they aren’t smooth finishes, but by now most pipemen know the therapeutic value of a good rustic or blast rolled between thumb and fingers is often preferred at the end of a difficult day. 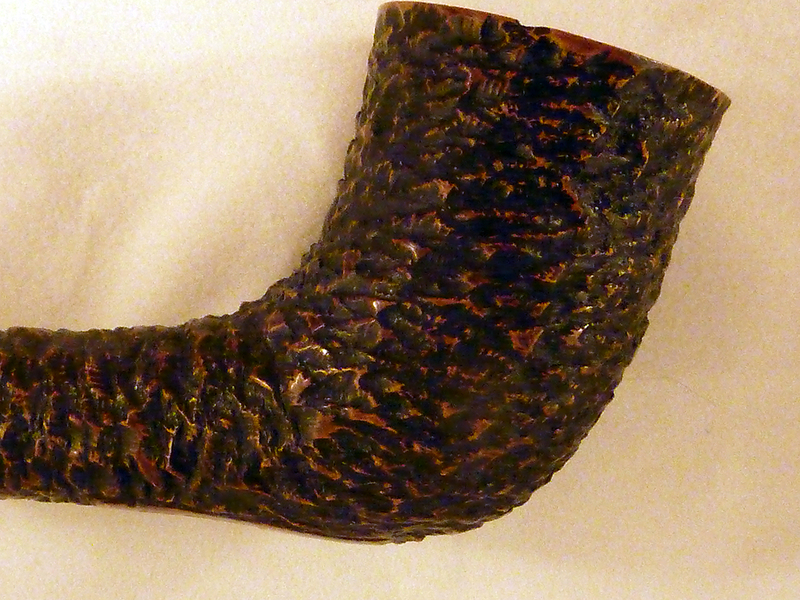 While the Derry line is unified in the stain treatment, nickel mount and acrylic stem color, by the nature of what it’s designed to do (use up discontinued bowls), if you look closely at the individual pipes (see below) you’ll notice the rustification treatment varies from shape to shape: some are fairly craggy, others have the more machined, “pine cone” rustification that gives dimensionality and visual interest but little hand-feel. The laser-engraved COMs are getting better. I didn’t get the light quite right on these, but with the naked eye they’re crisp and give all the vital information: PETERSON (in script) over small caps OF DUBLIN over Derry Rustic with the shape number to its side. It’s got a nice look, and after buying a high-end Royal Irish 120 with a botched hand-stamping, I’d have to say I prefer something clean and crisp over double-stamped and blurred any day. 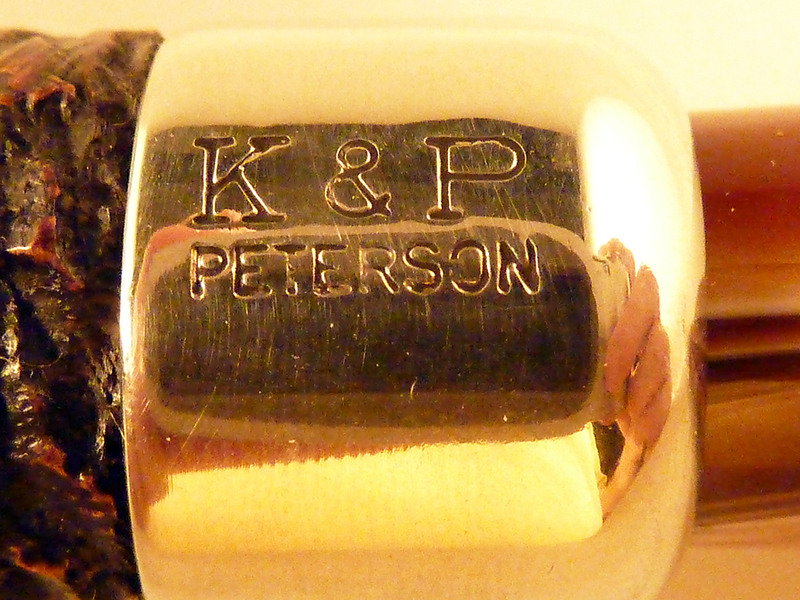 The nickel mounts still preserve the 1895 K&P maker’s mark over PETERSON, but as you can see from the photo, they need a bit of polishing. I realize it’s only nickel, but any DIY-er knows you can really make it sparkle with just a second or two on the buffer. Would it really cost more to have them machined at a higher gloss? The mortises are free of stain, and quite open, being made for military mounts, as you can see. So when all these glorious bowls from the B series are used up does that spell the end of Derry line? Turns out the answer is – no. Peterson has already slated a number of bowls into the line. Here’s the list of bowls currently in the Derry works from Tony as of last week: 01, A1, XL02, 03, 05, 31 Straight System, X61, 68, 87, XL90, 107, X220, 221, 408, 502, 606, 999, B7, B8, B10, B37, B41, B50, B51, B53, B55, B56, B62, B63, B64, B65, Junior Watson and the Junior Baskerville. The B51–aka Hopkins, an elephantine Magritte-inspired setter from the SH series. My advice, as always, is if you see a B shape in the line you like, don’t wait too long. I never did find my XL339. At around $100, the design language – shapes, stain, finish and stem – make the Derry one of Peterson’s most remarkable and affordable lines. Some of them surpass their original versions. Now you see them . . . now you don’t. This is one of the oldest and most admired of the Bs. I haven’t been able to track where it originally appeared, or why, or in what line. It’s one of those rarities that people talk about on the forums. It was released (or re-released) in the 2002 St. Patrick’s Day series. If anyone has any more information, please let me know so I can add it to this entry. Bowl Height: 1.66 in./42.05 mm. Chamber Depth: 1.39 in./35.32 mm. Chamber Diameter: 0.82 in./20.95 mm. Outside Diameter: 2.03 in./51.45 mm. The B8 is another early shape I haven’t been able to place. I do know it was issued in the Limerick line at some point, and made an appearance in the 2002 St. Patrick’s Day series. Again, maybe someone reading the blog can fill us in? 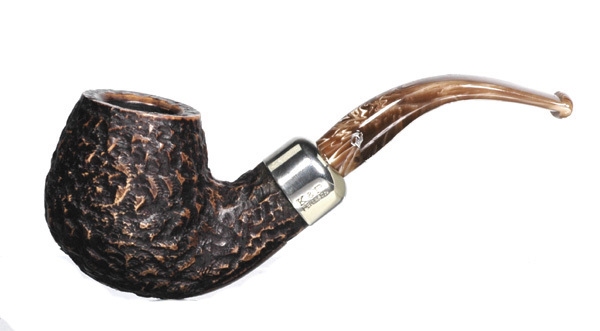 The B27 is a magnificent panel that debuted as LE (Limited Edition) 2007, and a bit later in the Italian Rock of Cashel line, a rusticated military mount with a marmalade acrylic stem. Like the B7, it looks incredible in the Derry line — better than the original. Bowl Height: 2.06 in./52.30 mm. Chamber Depth: 1.65 in./41.98 mm. Chamber Diameter: 0.83 in./20.97 mm. Outside Diameter: 1.44 in./36.64 mm. 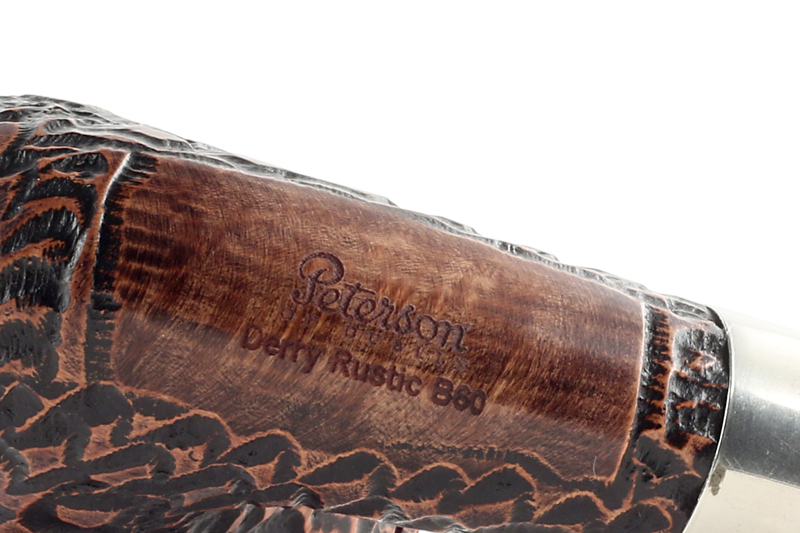 The B33, a big-chambered setter, was first released as the Corrib in the huge six-pipe 2007 Rivers Collection. It was subsequently released as a Kapet rustic (vulcanite stem) and the Italian Rock of Cashel line. This is by far its best presentation. Bowl Height: 2.31 in./58.59 mm. Chamber Depth: 1.92 in./48.73 mm. Chamber Diameter: 0.85 in./21.66 mm. Outside Diameter: 1.61 in./40.78 mm. One of my favorite Pete shapes, the B35 / Kaffir, has seen a long and distinguished service career. It began as the Antique Special Collection 2009’s Kaffir (B35), then appeared as the Italian Rock of Cashel rustic, military mount. 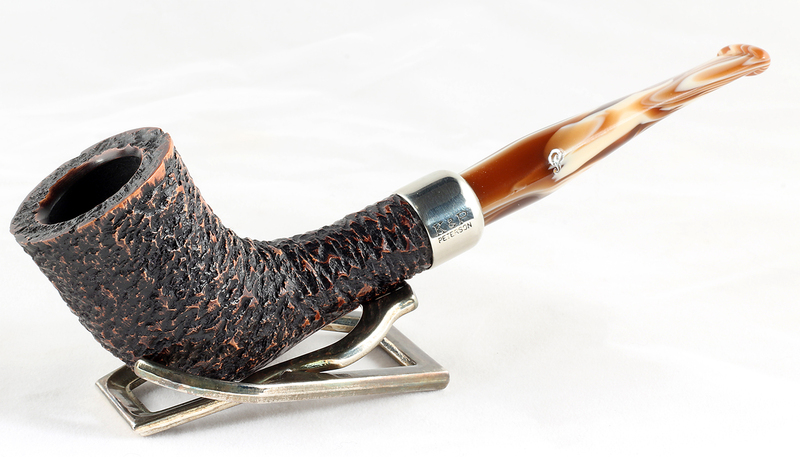 Following that, it was issued as a gorgeous smooth-grade vulcanite F/T pipe for 2014’s Christmas pipe, which was followed by a rustic mount with cinnamon-swirl acrylic F/T for the 2015 Christmas pipe. And now it’s come almost full circle to its 1906 roots as a military-mount rustic in the Derry line. Bowl Height: 1.99 in./50.57 mm. Chamber Depth: 1.67 in./42.35 mm. 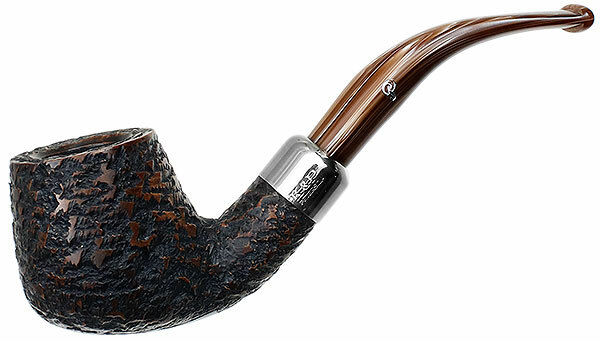 The B36 was first released as the Malahide, a seldom-seen barrel setter from the 2009 four-pipe Castle Collection. Again, this version (to my taste) is preferable to the original. Bowl Height: 1.93 in./49.11 mm. Chamber Depth: 1.53 in./38.84 mm. Outside Diameter: 1.46 in./37.18 mm. 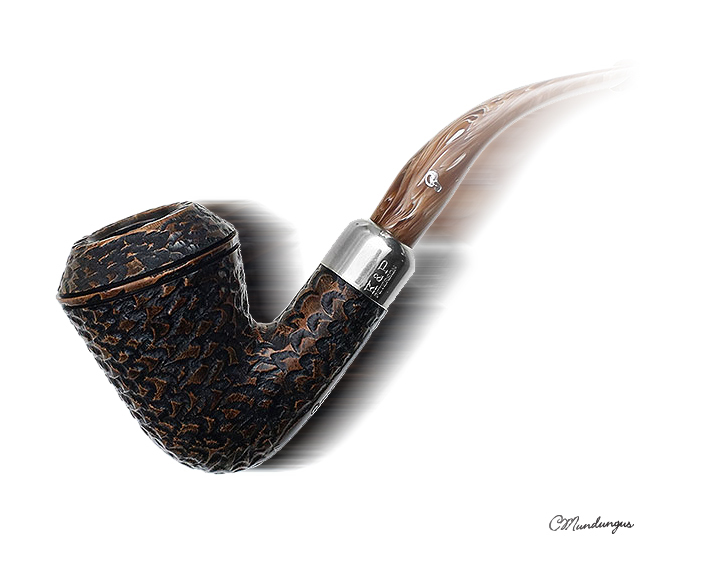 The B37 is the other half of the 2009 Antique Collection, a reproduction of an elegant bent billiard from the 1906 catalog. It’s been featured in two or three of Peterson’s Italian lines for Mario Lubinski. A remarkably fine bowl for Virginia lovers, the B49 has had an illustrious career, first appearing as the 2004 LE, then reappearing as the 2008 LE, followed by the 2011 Gregson from the Adventures of Sherlock Holmes. It also appeared in the Kapreis line from Italy as a sterling military mount. It is way beyond cool in this military mount and short stem. Chamber Depth: 1.98 in./50.29 mm. 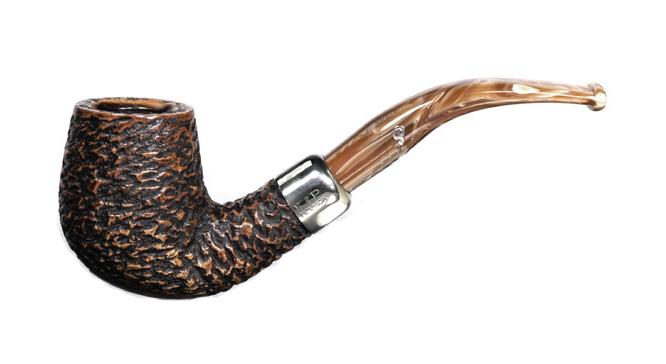 The B50 is an evil pipe—well, it was named after Professor Moriarty in its original issue in the Sherlock Holmes line, anyway. My own Moriarty has always lived up to its namesake’s genius, if not his unspeakable life of crime. 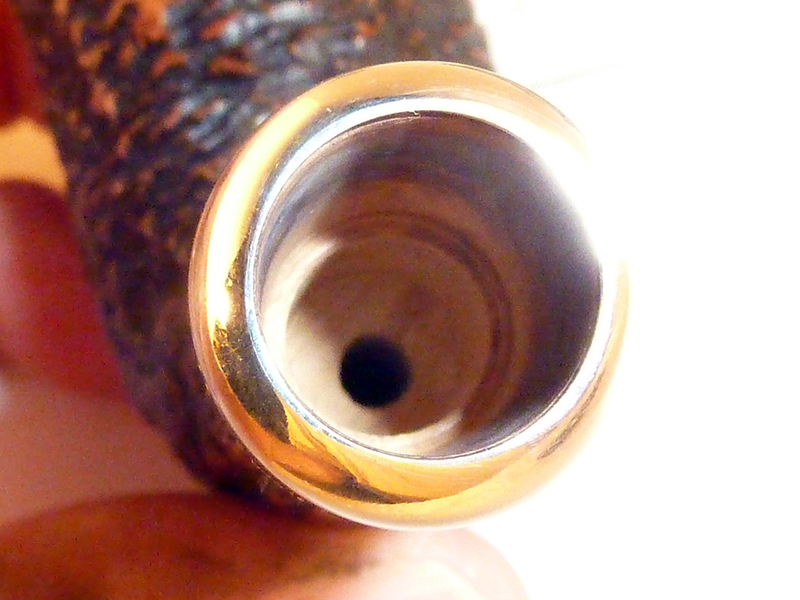 The ferrule on the Derry version foreshortens the effect of the original so much that at first I believed this was the bent billiard from the Molly Malone collection. 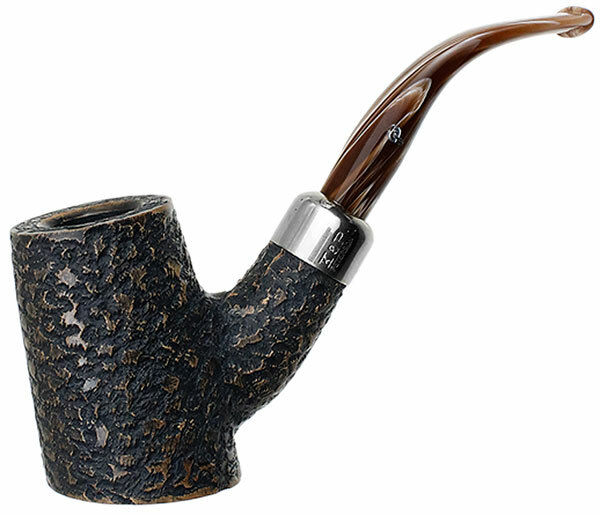 The B51 first appeared in the Adventures of Sherlock Holmes set as the gigantic, whimsical Hopkins in 2011, although it has since appeared Italian Kapreis line with sandblast finish and sterling military mount. At almost 77 grams, it’s a whopper, an ideal setter for a night of serious attention to your favorite craft brew. 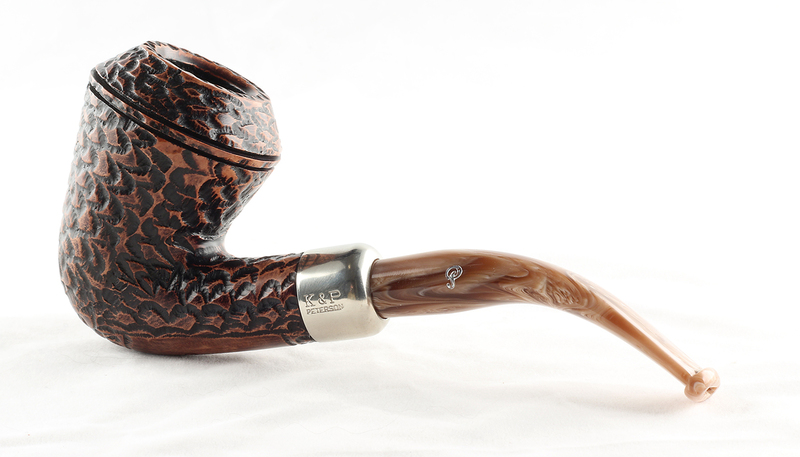 The B55 is the straight bulldog from the 2011 Molly Malone collection. I’ve seen it in a sterling mount Kapp Royal, but this one scores over it, if not as classy as the original issue. Here’s one of my favorites, The Bow from the 2012 Iceberg Collection that appeared to celebrate the centenary of the building of the Titanic in the Belfast shipyard. It was subsequently released for the 2013 SPD line in a smooth finish with a vulcanite mouthpiece. 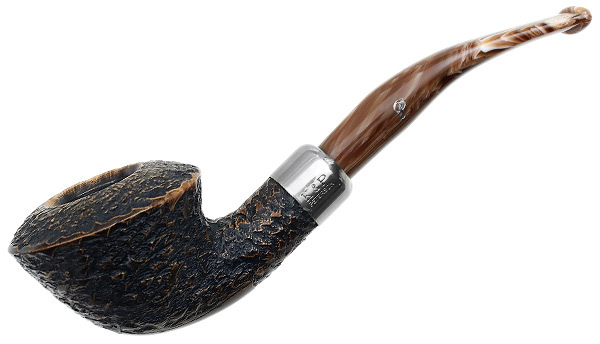 It’s quite similar to the 1997 Hansom, from the Return of Sherlock Holmes collection, albeit with a round rather than diamond shank. The B62 was first released as the LE 2013, one of the best brandy shapes Peterson has ever released. It was subsequently released as one of the prize catches from the 2014 Christmas line. Bowl Height: 2.05 in./52.13 mm. Chamber Depth: 1.66 in./42.26 mm. Chamber Diameter: 0.82 in./20.79 mm. Outside Diameter: 1.85 in./46.91 mm. The B65 was first released as the LE for 2014, a massive homage to the straight-walled early Patent Systems. It was released the following year as a rustic, sterling military mount in Italy. Chamber Depth: 1.86 in./47.16 mm. Chamber Diameter: 0.82 in./20.71 mm. Thanks to Smokingpipes.com for several of the Derry images. Thanks for all the detailed information on these Mark! We just got a batch of the Derry series in last week and they are beautiful, visually interesting pieces. I’m particularly partial to the ones that have more streaking and less swirl in the stem coloration, but I know that I’m in the minority there. Really, Phil? A BENT pipe? You’re branching out, sir! LOL. And yes, let’s talk about getting some paintings from you in the book! It’s not too late. I’m just about half-way through assigning illustrations, and your work would make an incredible contribution to the book. I bought the B27 and it’s a fine smoker and looks great! 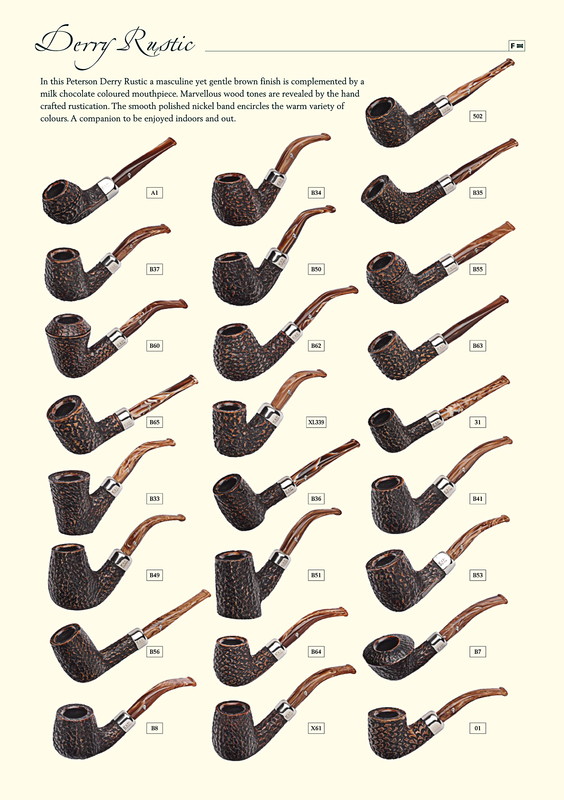 And the price can’t be beat for a fine pipe! You’re welcome. The B27 is one of the best of the line, I think. Much more fun than the original LE. 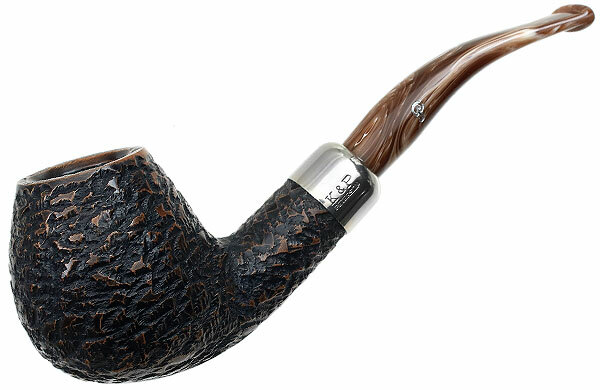 I could swear Smokingpipes.com had a Derry in the B53 Moran shape. Did anyone else see that one before it sold? I thought my eyes were deceiving me. Yup, I saw it, too!